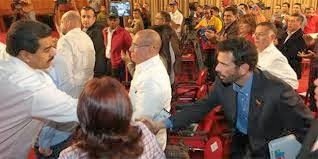 "... the inevitable recognition of this electoral result by the MUD helps PSUV to move forward with a “varnish of legitimacy”, particularly because the opposition had no other choice than to energize electoral participation by engaging in this municipal election with a national campaign against Maduro that was somehow portrait as a referendum on his presidency. However, PSUV not only lost the most important capital cities in Venezuela, it had set backs in symbolic capitals regained by the opposition such as Barinas, the capital of the State of Barinas, which is Chavez homeland and where the governor is the brother of the late president. This reality has imposed on the government the need to promote a political dialogue with the opposition, and to that the MUD (through its parliamentary fraction and newly elected majors) has engaged. The Dialogue sessions were a great window for the opposition to broadcast its message across the nation, while advocating an agenda focused on the two greater problems Venezuela now faces: Security and the Economy; and for which Maduro and his cabinet have shown lack of initiative and ideas..."
70% approve Maduro's price control measures. 49% reject Government's plan to increase gas prices. 80% reject a new devaluation. 63% still see Henrique Capriles as Venezuela's opposition leader. What is the Venezuela Initiative? The Venezuela Initiative is a Leadership Forum gathering the CDDA Fellows, successful members of the Venezuelan diaspora, foreign policy experts, opinion leaders and political communications advisors to mobilize resources from Venezuelans, the Venezuelan Diaspora, friends of Venezuela, multilateral organizations and foundations to finance its activities, focused on ideas to promote democratic changes and development in Venezuela. - Grants for community development in Venezuela and cooperation with Venezuela NGOs and grassroots movements. - Mobilizing and organizing the Venezuelan Diaspora and Fundraising. · To contribute to a change returning the Venezuela – US relations to its traditional democratic cooperation, prioritizing issues of economic development, hemispheric security and respect of Human Rights. The Center for Democracy and Development in the Americas is a global non-profit research and educational organization, acting as a platform for new ideas and leaders promoting sustainable democratic changes in the region. CDDA. Tema Sencillo. Con la tecnología de Blogger.